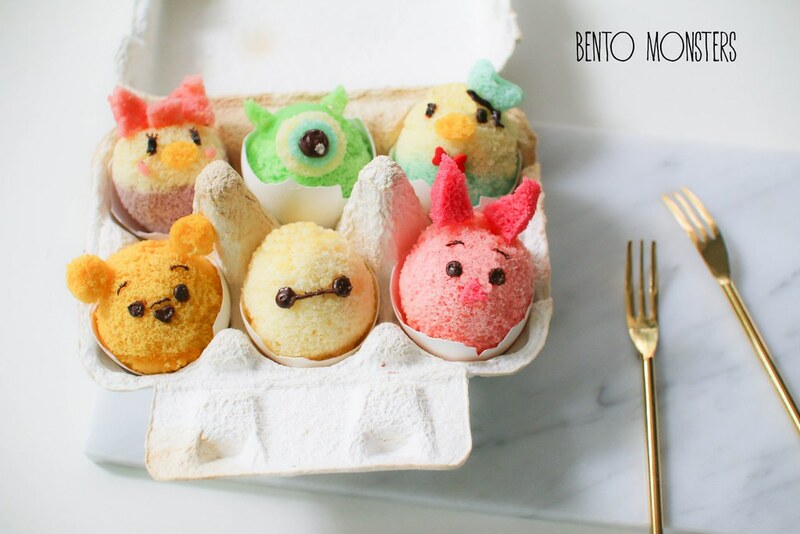 I'm updating my Tsum Tsum Easter creations today. I want to get this done before Good Friday, as I'll "disappear" for the next few days to catch my K-drama, the new episodes I've been waiting for all week is finally coming again, lol. 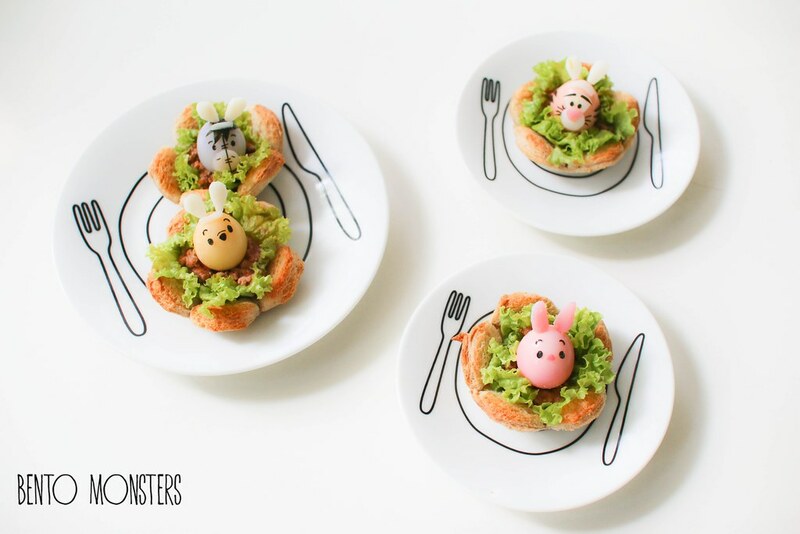 I did not managed to make much Easter creations this year, if you need more Easter ideas, you can check out all my past ones here. 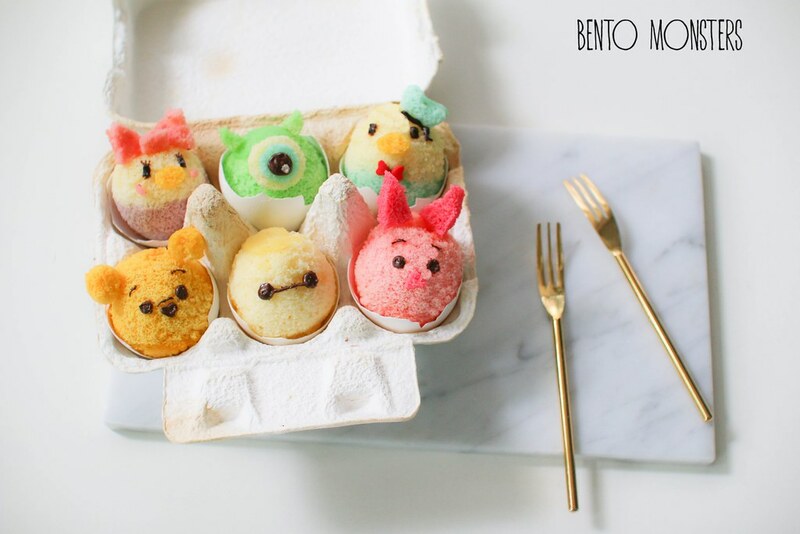 The first Easter Tsum Tsum I made were these chiffon cakes. They are meant to look like Easter eggs. 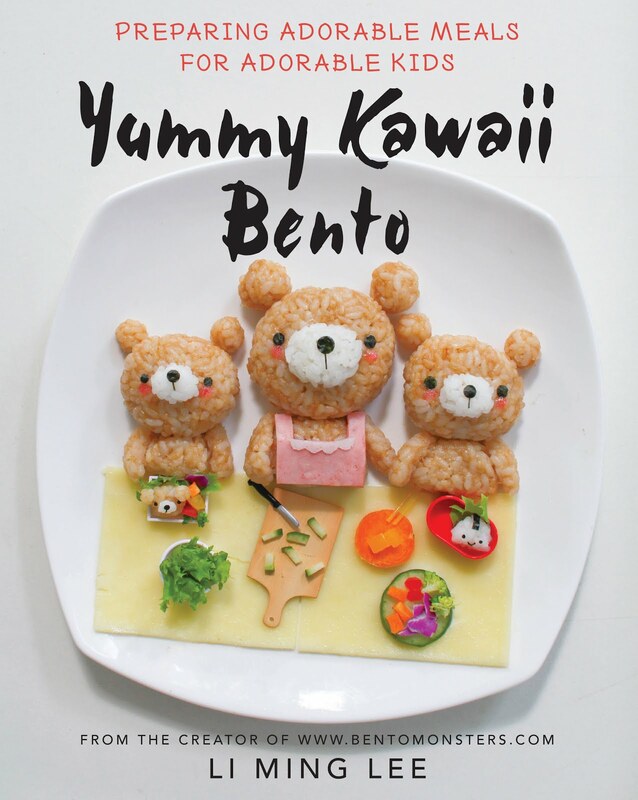 I actually wanted to make a rice version of this too, but did not have time to work on it. Maybe next year, if I'm still into Tsum Tsum then. The basic recipe I used is the same as the Gudetama chiffon cake recipe I shared earlier here, I just split the batter and colour them in different colours before folding in the egg white. 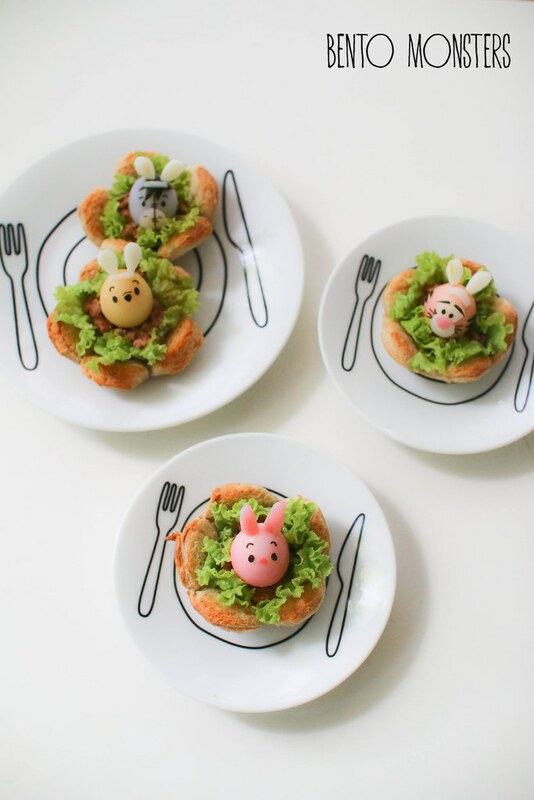 Tsum Tsum Pooh, Piglet, Tigger and Eeyore Easter eggs on bread cups. 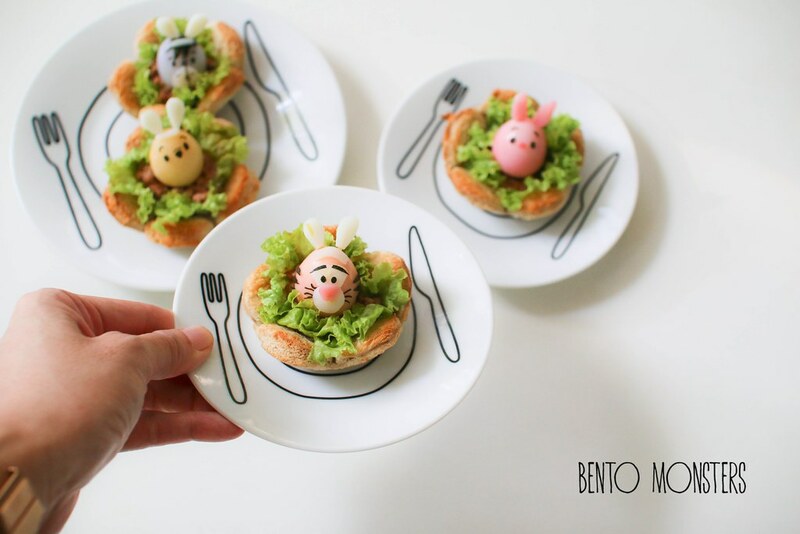 Here's the link to make the bread cups. This time I filled them with some minced pork curry. The quail eggs were all coloured naturally, beetroot for Piglet, curry powder for Pooh, mixture of beetroot and curry powder for Tigger and mixture of beetroot and red cabbage for Eeyore. A little troublesome though, a faster way would be just to colour them using food colouring. 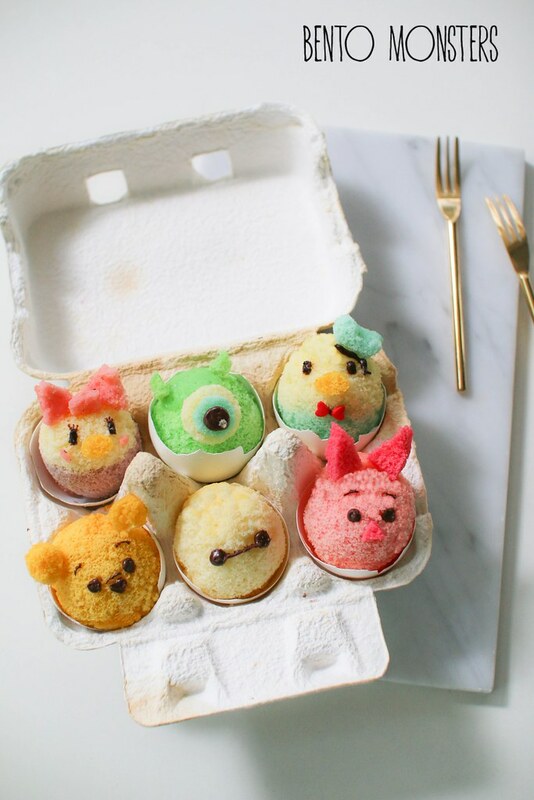 Ingredients used to make Pooh and friends were just nori and quail eggs. So sorry, I must have removed your comment accidentally. So cute! Love both ideas which you shared in this post! helo ming.. can i ask you how to stick the ears,bow on chiffon..? thx.. I used pasta sticks. Use fried ones(fry them till brown in a little oil) if you are going to eat them immediately. If you are going to eat them later, you can use uncooked ones, the moisture in the food will soften the pasta stick after a sometime.